And yet, I don't connect strongly to the film. Curtiz no doubt just wanted to get all of the elements together into something that worked, but cohesion trumps impact in this movie. It hits all its marks so neatly that the messy emotions it is supposed to reflect are never truly conjured. And as great as the actors are, no one is at their best. Take Bogart and Bergman: this was a crucial picture for both, establishing them as major stars and making the rest of their careers possible. Still, it's hard not to prefer what they did with the clout this movie gave them: Bogart lacks the bottomless menace of his performances in The Treasure of the Sierra Madre and In a Lonely Place, while Bergman isn't half so tragic a love triangle focal point as she would be in Hitchcock's Notorious and Under Capricorn. But then, both are held back by the biggest flaw of the movie, the unnecessary, distracting flashbacks. These serve no more purpose than padding to a story given significant enough weight by the pain etched in Bogie and Bergman's faces in the present. Rick's grim stupor, his bitter refusal to involve himself in the world, and Bergman's weary fear work perfectly well on the strength of the performers. To see the unspoken pasts they so effortlessly conjure between each other slightly grates. And don't get me started on the shamelessness of the gauzy close-ups on Bergman, which try too hard by half and counter the beauty and multifaceted cleverness of Curtiz's trademark use of shadow. Still, the film is a terrific showcase for Curtiz's talents, some of the most underrated in classic Hollywood, and its mash-up of noir, romance and topical war drama works better than it has any right to. It gets bonus points for its routine, implicit criticisms of the American reluctance to join the war, embodied in Rick's dispassionate personal isolation but hinted at throughout. When the hunted journalist/Czech resistance fighter Lászlo refuses to cooperate with Conrad Veidt's Nazi officer, he makes reference to having already withstood much more persuasive interrogation tactics in a concentration camp. It's strange to think that this film, a hit upon release and an enduring snapshot of America's entry into the war, also dismantles the conventional wisdom that people didn't really know what was going on in those camps until they started being liberated. 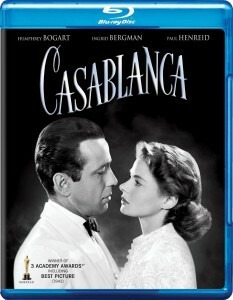 Warner's original Casablanca Blu-Ray looked terrific, the sturdy compositions never crisper. But this new disc, struck from a 4K restoration, manages to improve upon an already great transfer. The image is darker yet retains more information, working better in motion than my old Casablanca Blu-Ray. It's not a stunning upgrade, but that's because the last edition already took care of most of the work. Compare this to an older DVD version, maybe even an un-retouched 35mm print, and it would likely be revelatory. The real draw, though, is a lossless audio track sorely missing from the last release. The track faithfully reproduces the original mono, making the endless parade of quotable lines crisper than ever. -Two commentary tracks, one by film historian Rudy Behlmer, the other by Roger Ebert. Both are well-considered tracks, though I prefer Ebert's for his more engaging delivery. I don't share his abiding love for the film, but his enthusiasm is infectious. -Great Performances: Bacall on Bogart brings in Mrs. Bogie, as well as friends and colleagues, to extoll her husband's many virtues. It's a bit dry, and Bacall speaks more like an admirer than a lover, but it's a decent introduction for those who might not be familiar with one of Hollywood's most iconic actors. -Warner Night at the Movies offers an approximation of seeing Casablanca in 1942, complete with an old-school preview, a newsreel and some cartoons before launching into the film (if you hit "Play All." The most quaint feature on the set, but also my favorite. -Michael Curtiz: The Best Director You've Never Heard Of is a new addition, a 40-minute featurette that tries to do justice to an unfairly neglected director by overcompensating. Curtiz was truly a gifted craftsman with an impressively eclectic corpus, but when William Friedkin calls him the best filmmaker to ever work in America, it's hard not to roll one's eyes. Nevertheless, this is a fine overview peppered with amusing anecdotes and insights into his autocratic style, as well as a host of film clips that seem like the work of four different careers instead of just one. -Casablanca: An Unlikely Classic is another new feature, rounding up the same usual suspects from the previous extra to really emphasize that this is a good movie. Unfortunately, there's so much overlap between this, the broader Curtiz overview of the aforementioned mini-doc, and the commentary tracks (especially Behlmer's notes, as he's one of the talking heads). -You Must Remember This: A Tribute to Casablanca features older talking heads and therefore more input by those at least somewhat involved in the film, but at this point it's becoming clear that you really can spend too much time detailing the film's production. -As Time Goes By: The Children Remember is six minutes of cotton candy spinning into wisps, with one each of Bogie and Bergman's children offering reminiscences of the film and their parents' careers. -Assorted material, including outtakes, a Looney Tunes parody, and audio-only extras like radio broadcasts. Those who are still holding onto the DVD have better reason than ever to upgrade, even to this single-disc version. For those who already own the previous Blu-Ray, whether to upgrade depends chiefly on how you feel about the film. Those who believe earnestly in the consensus opinion of the film's placement in the pantheon will need little prodding to get this new version. For everyone else, though, the more-than-acceptable picture quality of the last release will suffice. Nevertheless, this disc is highly recommended. And yet, I don't connect strongly to the film. Curtiz no doubt just wanted to get all of the elements together into something that worked, but cohesion trumps impact in this movie. It hits all its marks so neatly that the messy emotions it is supposed to reflect are never truly conjured. And as great as the actors are, no one is at their best...Bogart lacks the bottomless menace of his performances in The Treasure of the Sierra Madre and In a Lonely Place, while Bergman isn't half so tragic a love triangle focal point as she would be in Hitchcock's Notorious and Under Capricorn. Yeah, that about nails it. I respect Casblanca without much loving it, and I've seen it at least 4 times. But I do prefer Bogie/Bergman's edgier, riskier work with Hitchcock/Huston/Ray to be a lot more satisfying that Curtiz' cleaner work with them here. Good piece though Jake, and I seriously envy you for getting put on Warner Bros' Blu-Ray shipping list. Looking forward to your next reviews for this series. Thanks Adam. I do enjoy this film and come back every now and then, but it's not my favorite Bergman, Bogie or Curtiz by any stretch.